The 2S Yoga is definitely very picky about chargers compared to say the GPD Pocket. Ok, thank you very much for your experience. 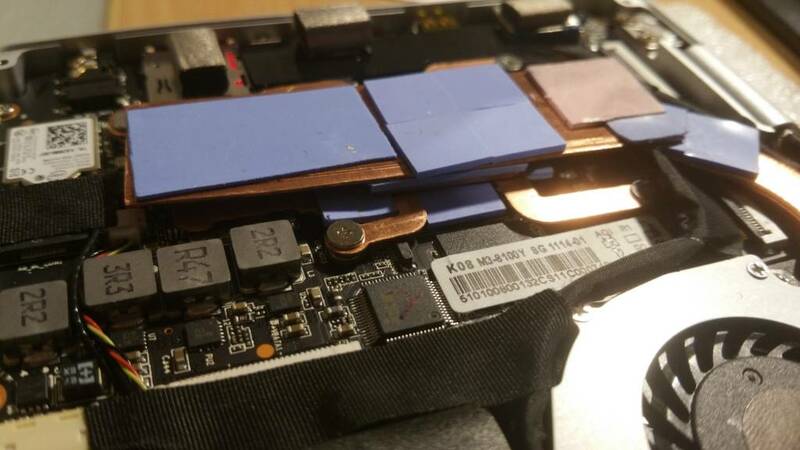 I was worried because I have read in several reviews that the laptop doesn't recharge with the most of mobile chargers and power banks, since I have only a few hours to recharge when I travel this problem can doing the laptop useless to me. Any trusted place to buy the laptop? ,but I think with no right to withdrawal, and it is sent from China... which makes me think that is neccesary pay taxes and so on, and the final price is much more. Anyone bought the laptop in geekbuying from China, are they trusted? They offer repairs under warranty and support from China? Has anyone figured out the max resolution of the micro-hdmi output? I've gotten the USB-C -> HDMI > DVI to go to 2560x1600. But I've only managed to get the Micro HDMI output to go to 1920 x 1200. I'm not sure if that is limited by my particular cables or if it's a limit on the port itself? Thank you jnjroach. Do you know the max resolution for the micro HDMI port? I promised a while back to post some pictures of my cooling mod, and recently finally found time to take some pics. 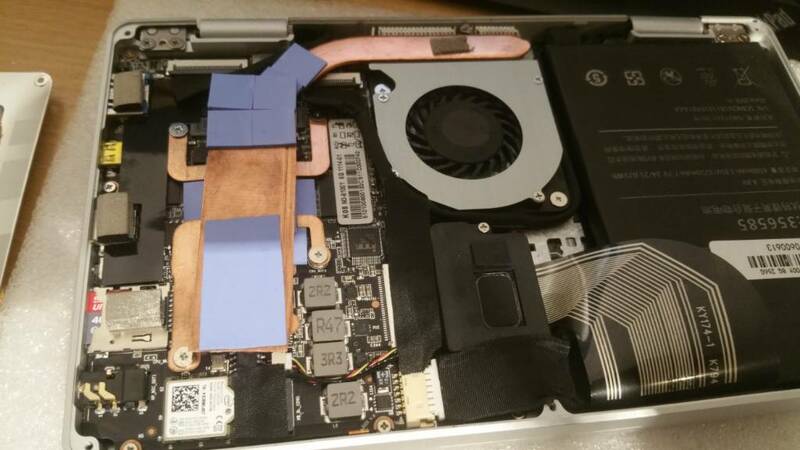 As mentioned there, I essentially put in a copper strip around 7 or 8cm long on top of the heat sink. I attached this with pieces of thermal pads on the lower side towards the heat sink and the upper side towards the back plate so it remains safely in place. 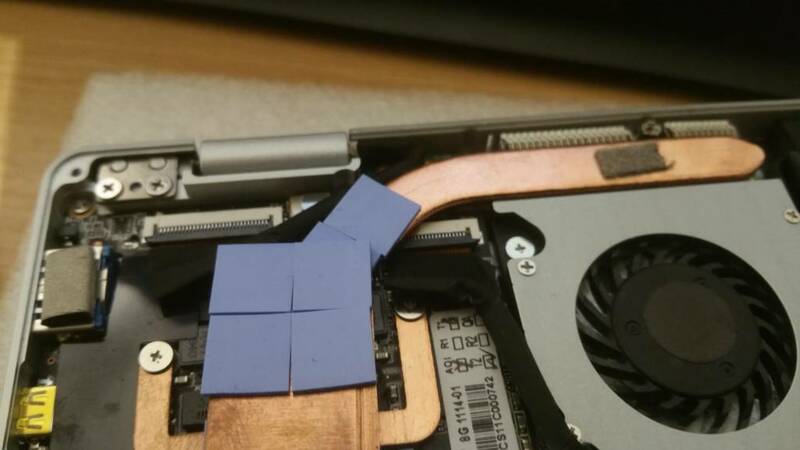 Also have some thermal pads in other spots of the heat sink to improve heat dissipation to the outside. 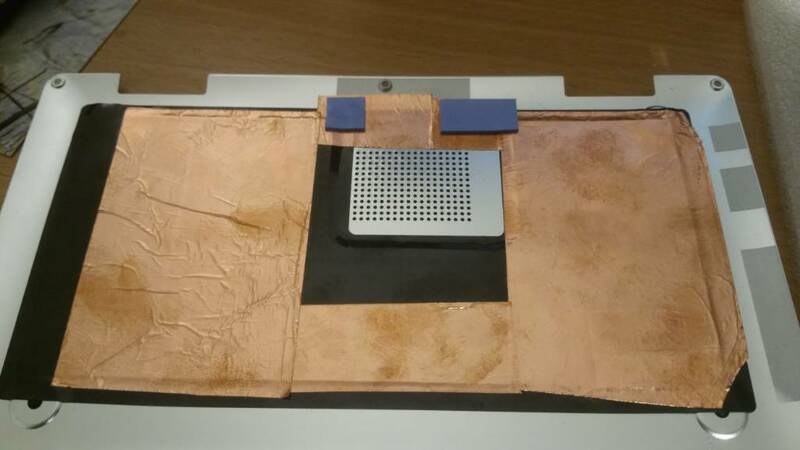 On the inside of the back plate I added a thin copper film. In addition, I also repasted the CPU with MX2 thermal paste. 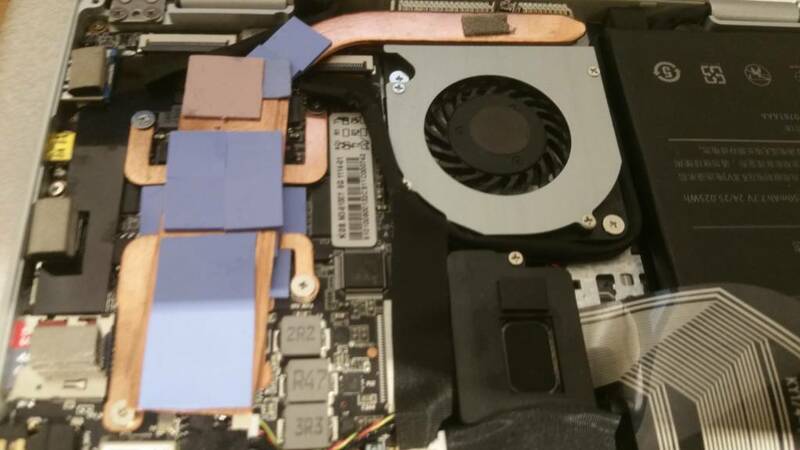 Recently I added another little copper shim between the larger copper strip and the heat sink right on to of the area where the CPU is because there was a gap between the strip and the heat sink there. 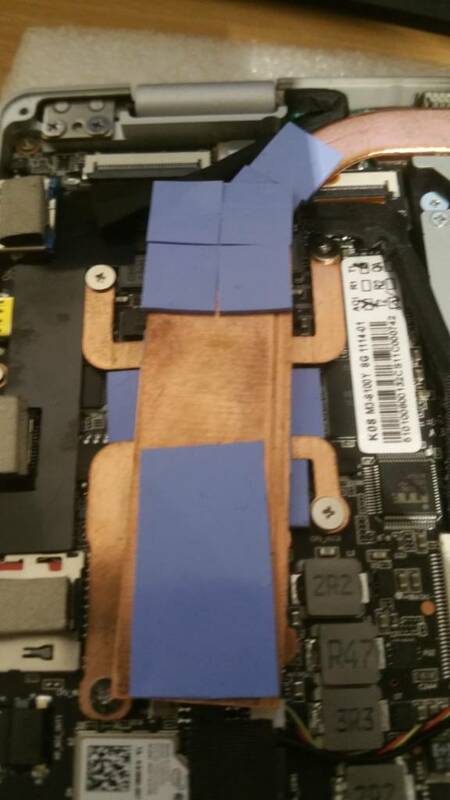 I put thermal paste on the lower side towards the CPU/heart sink and a thermal pad towards the top copper strip. This seems to have further reduced temperature by a bit, although it might not have a huge effect on top of the initial mod. I don't get any thermal throttling when running Prime95 (at least not within the 15 or 20 min I let it run), even with the TDP raised to 9W in Intel XTU. Temps go to around 75°C on the CPU if I remember correctly. Light usage (LaTeX editing, browsing, pdfs) on Linux is typically below 50°C with an occasional spike up when compiling LaTeX - when running on battery it's actually normally below 40°and silent. When on the charger and displaying an extended external display, CPU temps tend to be around 44°C. I suspect that some charging circuit must get pretty warm. On Linux, sensors gives me one temperature readout that goes up to around 65 (sometimes 70)°C when charging. Initially I feared it might be the SSD, but comparing the windows temp readouts that doesn't seem to be the case - SSD temp according to HWInfo on windows is around 50°C independently of whether I'm on charger or battery, and that unkown sensor readout on Linux only climbs up once I connect the charger. Unfortunately, I haven't been able to locate that point on the mainboard to see if I can improve cooling. If anyone had any suggestions I'm all ears! The reason is that I suspect that the fan seems to be partly controlled by that temperature as well - I'd love to have it off when doing simple work, and initially I thought the trigger point for the fan was when the CPU approaches 50°C, as it is sometimes off even when charging, but typically only at the beginning of a working session. So my hope would be if I could get the temps down of that other sensor that the device would be able to work silently most of the time. Alternatively, if anyone found a way to control the fan trigger points, I'd be very interested as well! I was able to get the Micro HDMI port to output up to 2560 x 1600 @ 60Hz, which is the highest resolution supported by my monitor. It may be able to push out higher, but I can't test it because I don't have a 4k monitor. Want to know something weird? Despite the Mu One charger doesn't list 12V and the manufacturer (Made In Mind) confirmed it doesn't , it does charge the One Mix Yoga 2S. What gives? I might need to invest in a USB C voltage meter. They seem to be preparing a third edition. No specific info yet, just an announcement of beta tests and some teasers about screen size and a hint that may suggest a QHD resolution (not sure that's actually something I'd need on a device this small, but OK).